Strongly condemning all violations of human rights in Myanmar, the third committee of the UN General Assembly in New York has adopted a resolution calling for a full and independent investigation to ensure that those responsible are held accountable. It would further call for the expeditious entry into operation of the independent mechanism established by the Human Rights Council, as well as steps to secure its effective functioning as soon as possible, according to a UN release received on Saturday. The Assembly would urge the international community to support the underfunded 2018 joint response plan for the Rohingya humanitarian crisis to ensure adequate resources to address the humanitarian crisis. A total of 142 countries voted in favour of the resolution brought jointly by the European Union and OIC. Myanmar, China and Russia, seven other countries voted against it and 26 nations — including Japan — abstained, said the UN release issued on November 16. Bangladesh and Austria placed the resolution on behalf of the OIC and EU respectively. A total of 103 countries, including the USA, Canada, Austria and Mexico co-sponsored the resolution. The representative of Turkey, introducing the draft on behalf of the Organization of Islamic Cooperation, expressed deep concern over serious human rights violations in Myanmar against the Rohingya. Without a comprehensive strategy, it is impossible to find solutions for the crisis. To end the vicious cycle of extensive and systematic attacks against the Rohingya, Myanmar must create the conditions for peaceful life, he said, stressing the need to implement human rights laws and bring perpetrators to justice. He underlined the importance of a full and independent investigation of such violations, noting that Myanmar signed a Memorandum of Understanding and established a commission of inquiry. 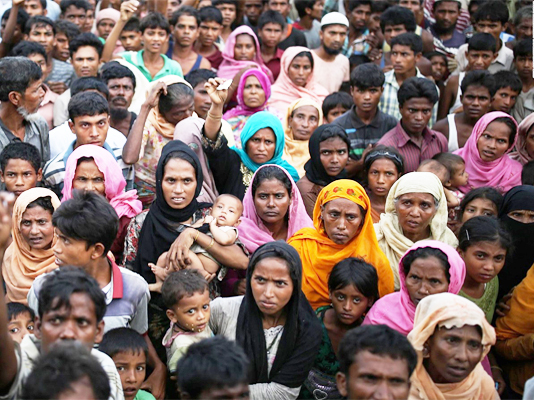 Welcoming Bangladesh’s efforts to address the humanitarian crisis, the Turkey representative said the voluntary and safe return of Rohingya is the only lasting solution, cautioning against transferring refugees from camps in one State to those in the other. “We must work tirelessly to urge Myanmar to address the root causes of the crisis”, the Turkey representative stressed, expressing the organization’s readiness to work with the United Nations and engaged parties. The representative of the United States expressed deep concern about serious human rights violations in “Burma” and Rakhine State. The US representative welcomed the government’s commitment to implement the Advisory Commission recommendations and the Memorandum of Understanding. However, commitments are not enough; Myanmar must take actions, the US representative added. The US representative stressed the importance of ensuring the return of displaced persons to their place of origin, while welcoming the establishment of an independent mechanism to collect and analyse data, echoing the call to immediately make it operational. The representative also voiced support for efforts to achieve accountability, commending the Special Rapporteur on developing insightful reports, despite Myanmar’s restrictions. The representative of Saudi Arabia said events in Myanmar continue to cast shadows of suspicion on positive political developments in the country. Such developments cannot be complete without including all people of Myanmar, the representative added. Bangladesh Permanent Representative to the UN Ambassador Masud Bin Momen stressed that the comity of nations must redeem itself for failing to prevent crimes against the Rohingya by heeding their call for identity, security and justice, and ensuring that “the most persecuted minority in the world is at least no longer the forgotten one”. Rohingya must be allowed to return home or to their place of choice, he said, adding that on the option of return, the Rohingyas were not convinced by Myanmar’s assurances, as not a single one had accepted that option. They wanted guarantees for a pathway to citizenship and land ownership, and dispensation of justice – legitimate demands to which Myanmar must respond, he added. Explaining Bangladesh’s position, Momen said Bangladesh’s Prime Minister stated that the Rohingya will return only if they wish. Bangladesh will continue to adhere to international humanitarian and human rights law, the representative said, adding that there is no gain for Bangladesh by either holding back the Rohingya or forcing their return.